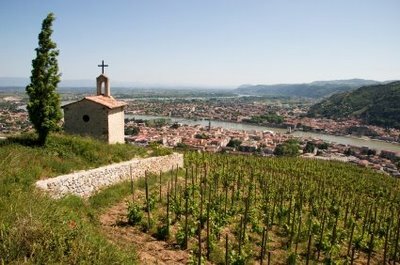 Sales of Rhône Valley wines remained stable last year with export sales proving particularly robust while harvest yields in 2017 were down 18%. In its annual overview of the region, InterRhône reports that total sales in 2017 amounted to 2.7 million hectolitres, with export volumes rising 7% in volume although the domestic market remained “sluggish”. The final yield in the difficult 2017 vintage was 2.5m hl, slightly smaller than the 2013 harvest and 18% down on the 3m hl harvested in 2016. Eighty percent of the total production, over 2m hl, was of red, then 13% (335,180hl) of rosé and 7% (163,026hl) of white wine. Last year the Rhône exported around 128m bottles, a rise of 7% and with an 8% uptick in value too from €458m to €493m. Looking at exports alone, 62% or over half a million hectolitres went to European markets. The next biggest market accounting for 22% of exports was the US and Asia accounted for 12%. The biggest single market remains the UK and this is despite a decline in volume over 2016-17 of 3% from 164,668hl to 159,761hl and a decline in value of 4% from €77.5m to €74.1m. InterRhône explained that sales in large scale retailers had proved sluggish in the UK and was the main reason for the faltering figures but also that the UK was not alone in this regard. The next biggest market, Belgium, also saw volume and value exports decline 3% and 6% respectively. Surging upwards however was the US with a volume increase of 19% to 151,474hl and value increase of 21% to €101.8m. There were also strong gains in Germany (volume up 8% and value 11%) and China (up 50% by volume and 43% by value).